No show report from me this year. As things turned out, my wife's Masters thesis presentation fell on show Saturday - at Atlantic University in Virginia Beach. This meant I only had setup Thursday to walk the aisles. We then flew out of Denver 6:00AM Friday morning and returned Sunday by 1:30PM. When Ivette and I arrived back at the Tech Center Marriott, the show only had two hours of life left. What follows are a few "people pictures" which will segue into a more formal show coverage once Paul Candy, Marja & Henk and Stephæn hand in their contributions. To the right, Ivette's novel that became the culmination of an intense 3-year study in Transpersonal Psychology and served as her formal thesis project. 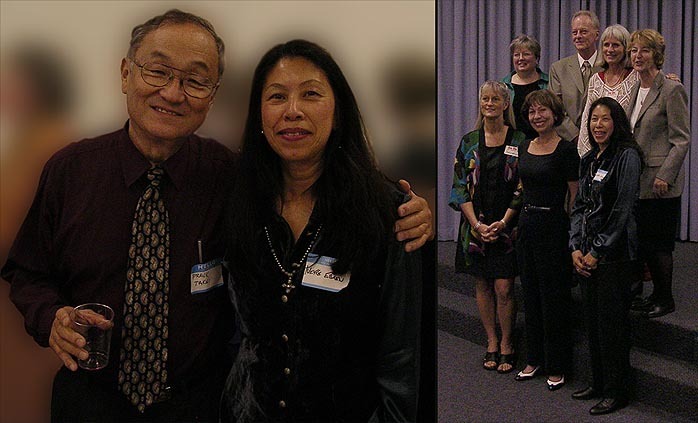 Below with her favorite professor Frank Takai and her fellow graduates. The Rocky Mountain Audio Show became the rollout event for Avalon's new second-from-the-top Isis speaker, captured here during setup day. 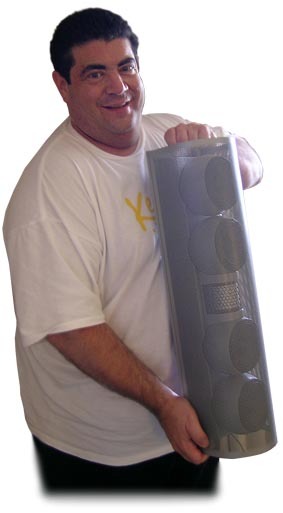 That this important launch would have been reserved for Al Stiefel's event rather than HE2005 or CES 2006 -- Alan of Red Rock Audio took over show reins from Ron Welborne [below] with whom he collaborated last year for the first Denver show -- speaks volumes both for the real need this event serves as well as the enthusiasm whereby our cottage industry has responded to it. Affordable. Accessible. Friendly. In the spirit of VSAC but expanded to include mainstream offerings outside of tubes and horns yet still host many smaller companies that can't afford the expense of Las Vegas or Primedia. Those are the key descriptors for RMAF. effort for the High End for which CES no longer provides enough of an audience, we need more than one regional audio show to really get our message across. Of course playing music regular folks actually listen to -- remember that Country Western and Rap make up a far larger percentage of what the multitudes consume rather than Jazz, Classical and select recordings with unusually high production and sound values -- is only one of the many elements that the current way of doing things still doesn't account for at all. We're all old fogies in that regard. As the iPod phenomenon proves, music listening is far from dead. 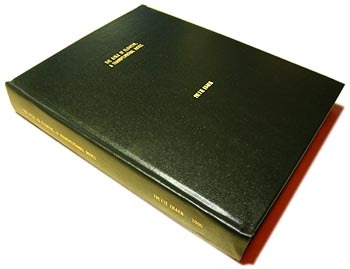 However, unless delivered in a way that corresponds to the actual life style of the target audience -- the younger people our collective lip service pretends to be concerned over -- running shows that appeal mostly to the in-crowd by how they present audio is probably not a whole lot more than a valiant but ultimately fruitless effort. However, I will leave serious commentary to others who actually attended this event in earnest. 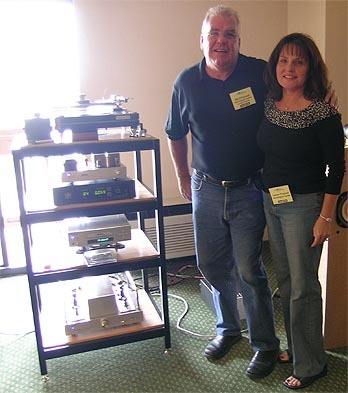 Bill O'Connell aka the MiniMax man and Song Kim of Canadian Song Audio fame brought their wives to demonstrate that love of music and gear need not be an exclusively male pastime. Bravo! 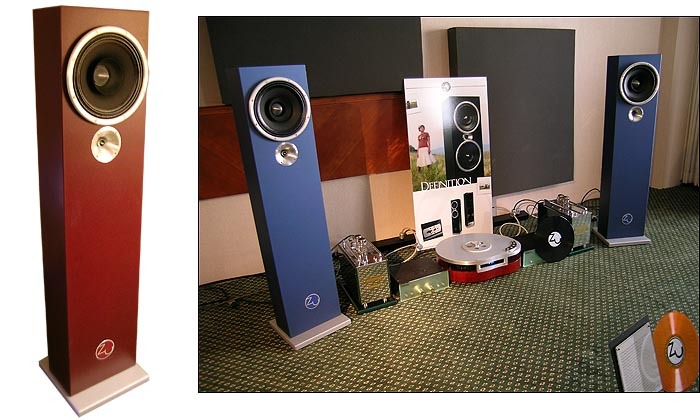 Anthony Gallo showed his new "Reference 3 on the wall", the as yet unnamed vertical iteration of the Reference Center. 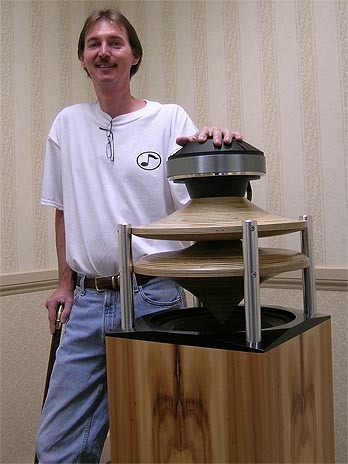 Using four instead of two spheres, with the outer ones augmenting bass below 100Hz to extend the speaker to well below 50Hz, this exploded head section of the Reference 3 comes with an integral wall mount, with a floor stand in the works but optional. 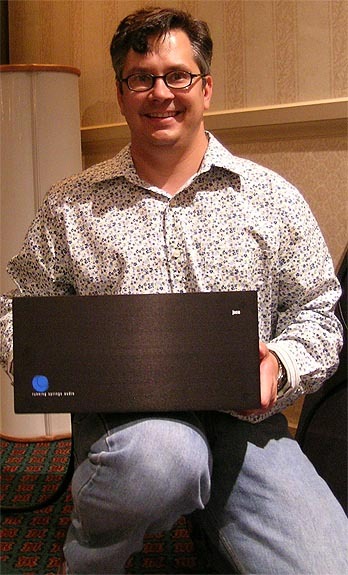 With the "big surprise" scheduled for CES 2006 -- something many amp designers have attempted for decades but never fully pulled off -- Eduardo de Lima of Audiopax showed a new speaker which one showgoer (who either refused to listen to it or otherwise was deaf) insisted looked like a Rega and hence couldn't possibly be anything other than a shameful knock-off. That it sounds completely different escaped this gentleman entirely. 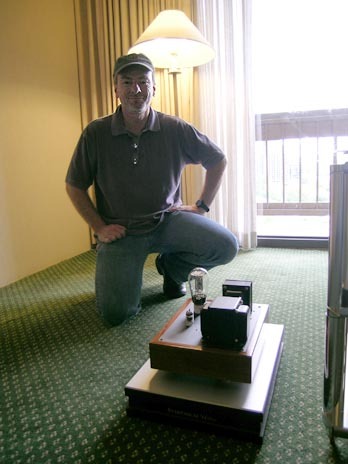 Dan Wright of ModWright hammed it up for my impromptu photo op with his well-received SWL 9.0SE preamp. A matching phonostage is in the works. 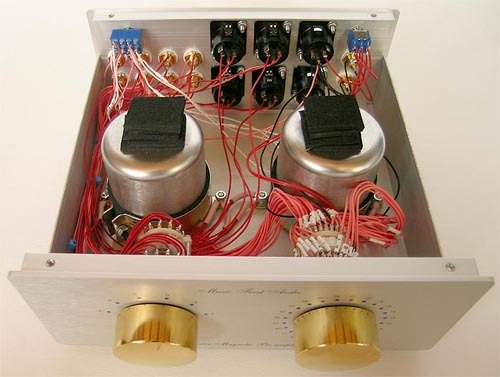 A tubed DAC is on the books as well, with both vinyl and digital modules retrofittable inside the preamp by relocating its power supply outboard. 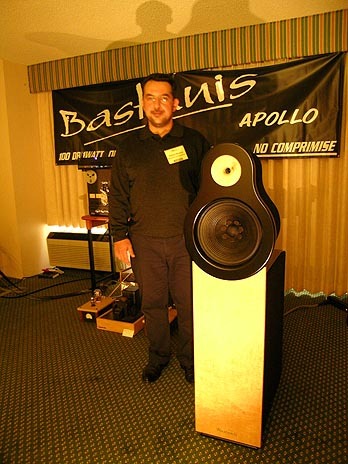 Mr. Bastanis from Germany showed his flagship Apollo, a 100dB efficient 10-inch wide bander with horn tweeter and active subwoofer that's also available in a downscaled version and DIY package. 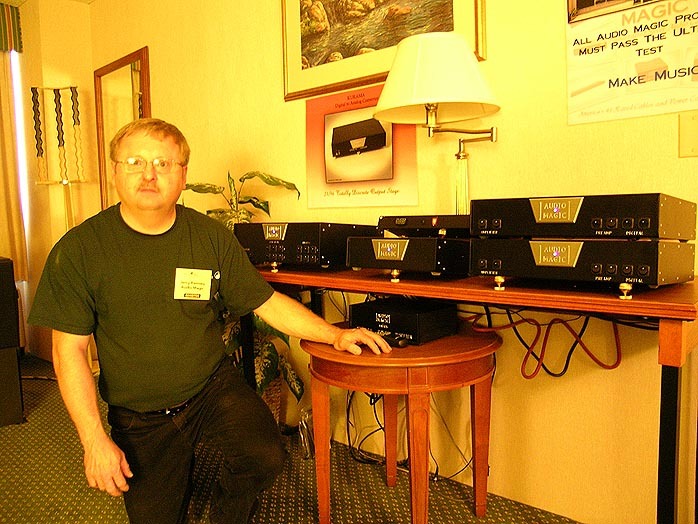 Jerry Ramsey of Audio Magic showed a new look for his extensive lineup of power line conditioners, DAC and amps which continue to utilize his cost-effective black box but now add a deeply engraved beauty plate for a two-tone detail. Lloyd Walker, Verity Audio's Julien Pelchat and Fred Law (Lloyd's comrade in arms) demonstrated proper New Mexico "men at work" highway construction etiquette - three guys watching while one fella works. In this instance I was sweating in the listening seat with the proper helmet. If you can call that work. 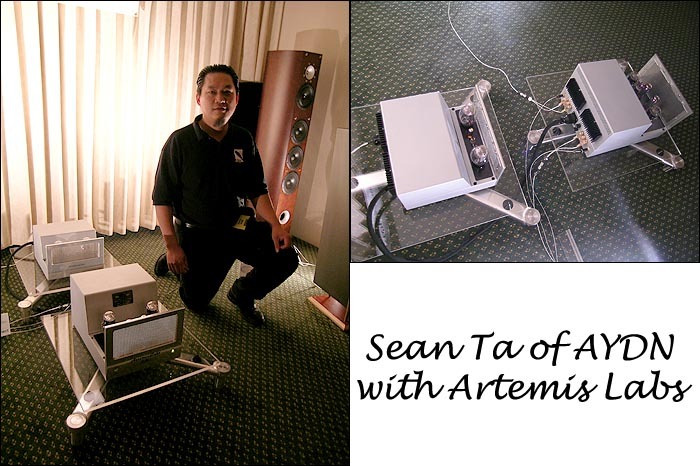 80 pounds of outboard power supply back up Artemis Labs' new 15-watt 300B amps. 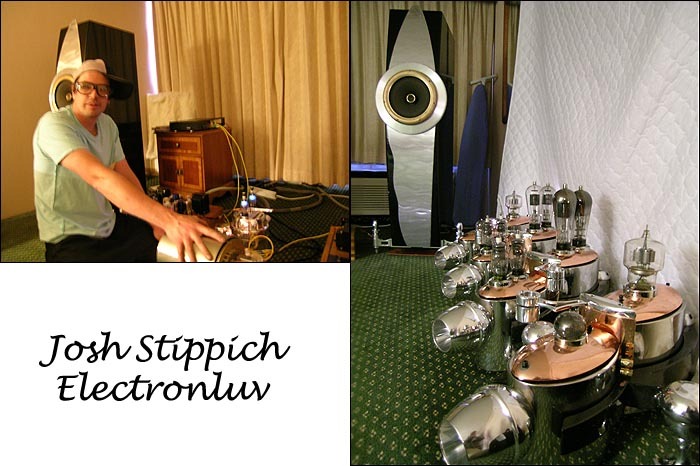 A PHY-based single-driver speaker and a plethora of Flash Gordon-esque amps mixed it up in the always eye-popping Electronluv exhibit. 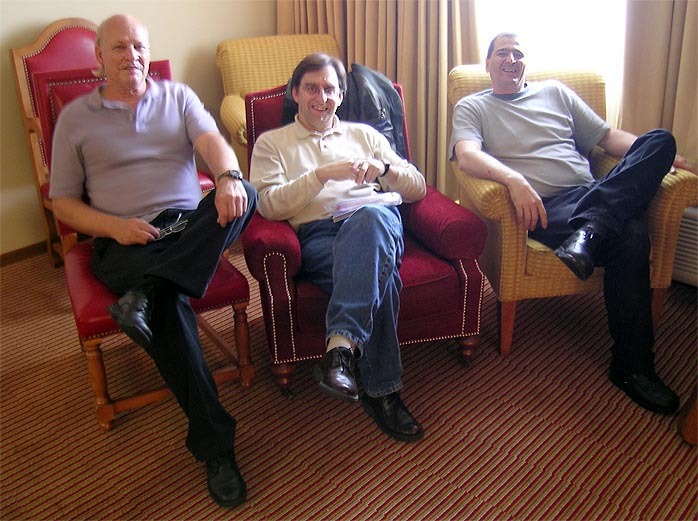 Underground faves Louis Chochos of Omega Loudspeakers and Vinnie Rossie of Red Wine Audio do the cheese thing while fj importer Tom Hill from Hudson Audio opts for the more wistful expression befitting audio's seriousness. 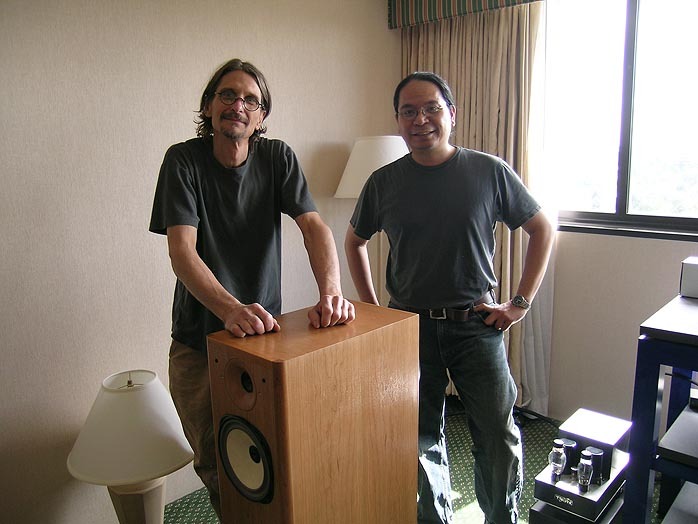 The Highwater Sound boyz had sound already on Thursday when most rooms still sported boxes sans bodies. Duevel importer Ted Linblad owns the website domain in www.highendaudio.com while Lenny Mayeux of Running Springs Audio showed off the new front panel look. Zu Cable went color and brought Druids in red and blue. Feeding sagging blood sugar levels after 3 days of room-locked cabin fever is the traditional way to wrap up any show. 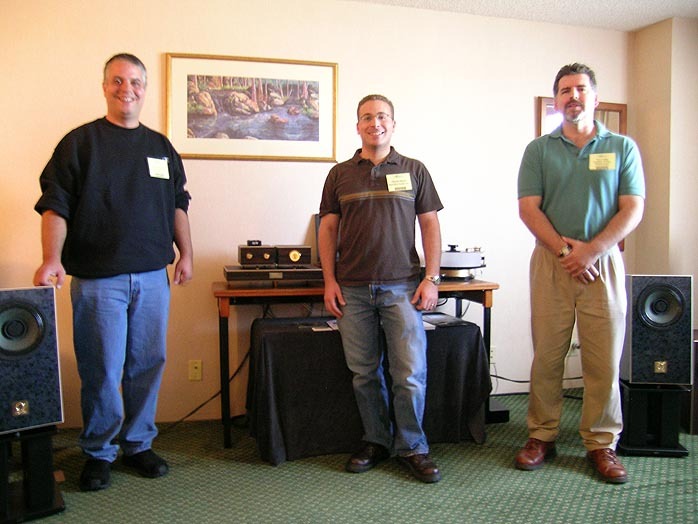 In our case, excellent company was provided by Gordon Burkhardt-Schultz and Eduardo de Lima of Audiopax, Adam Decaria and Sean Casey of Zu and Walter Swanbon of Fidelis AV [to my right] who is not only the Audiopax, Harbeth and Lavardin importer but recently picked up Music First Audio. 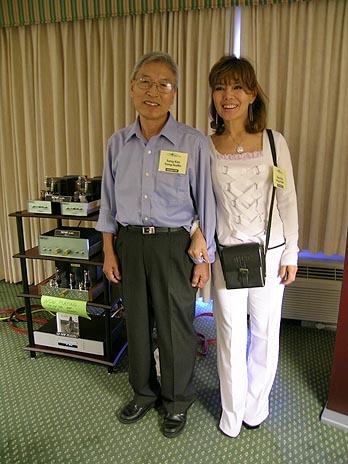 Their Passive Magnetic Preamp has won HiFi News' Preamp of the Year award and presently finds itself in Taos - for unknown reasons, naturally.